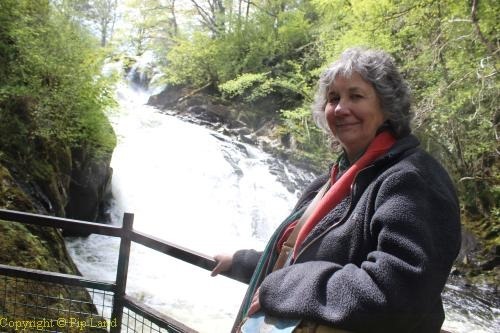 A memorable May-time visit to Snowdonia, Blaenau Ffestiniog where we stayed at Isallt House and went down into the Llechwedd Slate Caverns, had return trips on the Ffestiniog Railway and the Great Orme Tramway, and saw the Swallow Falls at Betws-y-Coed. Click on the photograph below – of the mountains of Snowdonia from the Cob at Porthmadog – to see more pictures including of Dr Zigs Extraordinary Bubbles Shop. On our first full day in Snowdonia there was no escaping its reputation for being one of the wettest places in Britain – or that of Blaenau Ffestiniog for being the wettest town in North Wales. Not that we were too worried as, after the excellent, large, breakfast we had so thoroughly enjoyed at Isallt House we were happy to go and rest in our comfortable bedroom and watch a Ffestiniog Railway steam train arrive at the station. Room number one with its three large windows provided us with a panoramic view of the station and the hills beyond. After a while we decided to venture out but only as far as the Llechwedd Slate Caverns. Not for us, however, Europe’s longest zip line (Zip World Titan) or the four world beating downhill mountain bike tracks high above the mine. No, we were happy to settle for a trip down into depths on the Victorian Mine Tour. This tour of the Deep Mine begins with a short ride on the steepest cable railway in Britain. This carries you nearly 500 feet (150m) underground at a gradient of 1:1.8 or 30 degrees. It was definitely not made for large, tall men! So David was pleased to get out at the other end and begin the guided tour of several huge caverns. Sadly there were times when the sound effects and music made it very difficult for us to hear the guide. Often our hard hats banged on the low roofs of the tunnels and it was always a relief to reach a cavern. On occasions the main lights were left off so that we could get some idea of what it was like working in there using just candle light. Those dark, damp caverns were, therefore, a good place to begin our visit to North Wales for it gave us a perspective of what men had to do to hew out the slate in the mid 19th century. Blaenau Ffestiniog was the only place in North Wales where the slate was mined rather than quarried. Our guide explained that the best slate came from the deepest depths of the mines. Sadly the men who mined it paid a high price, often dying in their 40s after 20 or more years toiling away in the darkness for 10 to 12 hours each working day. I tried to comprehend what it must have been like during winter when they would never have seen daylight for days on end. Blaenau Ffestiniog would not have existed without the slate mines. In the 1850s it was a burgeoning new town as men, with their families, moved in from neighbouring areas. Its population grew to over 12,000 during the boom years of the 1860s and 1870s. It’s a third of that now and many rely on the tourist trade for work. It was still raining heavily when we emerged from the mine. After a visit to the slate workshop, and a hot drink in the café, we decided to not visit the Victorian village there and instead drive to the coast in search of better weather. In Portmadog we waited in a queue of traffic while a Welsh Highland Railway steam train crossed the road to reach the station shared with the Ffestiniog Railway. We drove to Criccieth and after a brief look at the beach and castle travelled on to Pwlleli. It was an enjoyable, picturesque drive with the mountains of Snowdonia on one side and the coast on the other. And very little rain! Back in Blaenau Ffestiniog our short walk to Gwesty Ty Gorsaf Hotel (the station inn) provided us with an opportunity to appreciate the work done to regenerate the centre of the town. We were impressed by the way that the three 40 feet (12m) high slate sculptures complimented the towering rocky outcrop on the east side of the road, and those mighty ‘hills’ of slate waste which make the landscape of the town so distinctive. We dined several times at that hotel because the chefs were very good at making sure that, despite all our food intolerances and allergies, we could eat safely and well. David was especially pleased that they fried chips in a separate fryer so he didn’t have to worry about any shell fish residue in the oil and, therefore, no fear of going into anaphylactic shock. It was cold and windy the following day but at least it wasn’t raining. On sunny days there can’t be a better place to sit and watch the trains than on the patio at Isallt House. Richard Hope has a small coffee shop there and serves not just cakes, tea and coffee but also his delicious homemade drinks like pink lemonade and ginger beer. From Isallt House it’s just a short walk over a bridge to the station. On the train we were served drinks by some of the many volunteers who help to make the Ffestiniog Railway such an excellent experience. The train was full as it pulled away from Blaenau Ffestiniog for the 13.5 mile (21.7m) journey to Porthmadog. Below: making new friends on the train. When the line was constructed in the 1830s it was designed so that the slate wagons, with two or three brake masters, could descend by gravity. With the deviation (diversion) around the Tanygrisiau reservoir that is no longer be possible. Volunteers worked from 1954 until 1982 to restore the line and the deviation around the reservoir took 13 years to complete. At Porthmadog we visited the Maritime Museum with its record of how the slate trade led to a thriving ship building industry in the 19th century – including the beautifully crafted Western Ocean Yachts. David had the great idea of upgrading our return tickets to 1st class so that, on the return journey, we could sit in comfort and enjoy the wonderful views from the observation carriage which was at the back of the train from Porthmadog. He also bought the illustrated guidebook to the railway. Both made our journey to Blaenau Ffestiniog even more enjoyable and interesting. As we left Porthmadog there were magnificent views across the Glaslyn Estuary and marshes, and also towards the mountains of Snowdonia. It was a good time to visit with the trees not yet in their full plumage and so, after leaving Penrhyn, we could still see much of the Dwyryd estuary as we entered the ancient woodlands which surround this line. The young green leaves of the sessile oaks and birch trees provided a perfect canopy for the bluebells carpeting the forest glades. The woodland can be explored via the footpaths fanning out from Tan y Bwich station. We continued our journey in comfort past the reservoir and into the outskirts of Blaenau Ffestiniog where we marvelled at how the narrow-gauge line was squeezed in between the cottages on either side. The next day we took the high road over the Crimea Pass. Here the A470 sheds its greenery and passes gaunt towering rocky slopes, hills of slate waste and derelict buildings – stark reminders of past industry. The name of the pass comes, it is believed, from the fact that the A470 connecting Conwy and Blaenau Ffestiniog was opened in 1854 during the Crimean War. An inn at the 1,263 ft (385m) high summit of the pass was known locally as “the Crimea”. Our objective that day was the Great Orme Tramway. David was very keen to see that but first we experienced part of the awe-inspiring four-mile long Marine Drive around Great Orme. That was worth every penny of the £2.50 road toll. 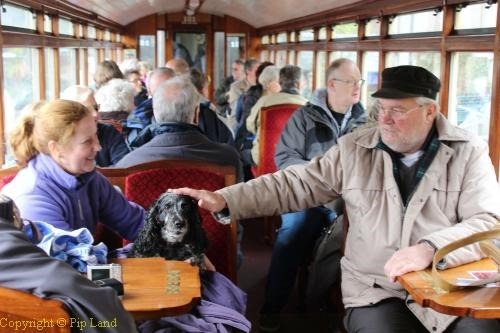 We were glad to be inside a warm car for there was a very cold blustery wind which made it impossible for the Llandudno Cable Car to operate. At the summit of Great Orme we had to put on our winter coats – and when I was waiting for a tram to leave the station at the top so that I could photograph it with a backdrop of Conwy Bay and Bishop’s Quarry my fingers felt as if they would freeze to the camera. It was a relief to go to the summit café for a hot drink and then browse among the interesting exhibits in the visitor centre. At the latter we learnt about bronze-age copper mining on Great Orme and that the street cable tramway was the only one still existing in Britain. It was exhilarating to ride on this impressive piece of Victorian engineering for the mile (1,500m) into Llandudno. This has to be done in two sections, one from the summit to the Halfway Station and the next to Victoria Station in Llandudno and it is during the latter that this funicular tramway is on a gradient of 1 in 3.8. At Victoria Station it was lovely and warm! We felt rather odd bundled up in warm clothing while men walked past wearing short-sleeved shirts. Those getting on board, however, were prepared for colder conditions. We were joined not only by visitors like ourselves but also by Welsh speaking mums with their young children. At the summit they took their children to the playground while we finished our visit by driving along the rest of Marine Drive, passing St Tudno’s church and its cemetery. By then it was time to find somewhere to eat and so we headed for the Pizza Hut at Llandudno Junction. The friendly staff were very helpful in dealing with our food intolerances and allergies. They produced an excellent pizza for me with no tomato sauce and topped with goats cheese, ham and pineapple. My only complaint was that Pizza Hut no longer provided virgin oil and balsamic dressing. So the waitress promptly brought me a balsamic sauce from the kitchen. After a good lunch we wanted somewhere to stop and rest for a while. We found that on the outskirts of Bangor in a free car park overlooking Port Penryhn. Later we had a brief look at the Menai Bridge before heading towards the mountains. This time we went to Llanberis. We did not stop at Llanberis but it still left a lasting impression thanks to the sheer size of the Dinorwic slate quarry and its tips of waste on the eastern side of Llyn (Lake) Padarn. We drove on into the rugged Llanberis Pass with Mt Snowdon soon looming above us. All the large rocks strewn along the sides of the road reminded me of the stone-giants in Tolkien’s Hobbit. I could just imagine them leaving that much ‘litter’ after a playful stone fight. It wasn’t until we got nearer to Betws-y-Coed that we were back among the soft green undulating deciduous woodlands, demarcated clearly by dark, brooding swathes of pine forest. This to me defined North Wales compared to the Yorkshire Dales or Glencoe in Scotland. At Betws-y-Coed railway station we thankfully found a restaurant which was still open where we could sit outside in the warm late afternoon sunshine and have either coffee or hot chocolate. We liked this town so much that we decided to return the following day. Sadly we were a week too early for the antique fairs which are held there, and the car museum had closed several years ago. We did, however, enjoy the ‘Flight over Snowdon’ video and the exhibition at the Snowdonia National Park Visitor Centre – and were captivated by the bubbles created by those at Dr Zigs Extraordinary Bubble Shop. We also thoroughly enjoyed the Conwy Valley Railway Museum even if some of the exhibits needed some TLC. My last request was to go and see the Swallow Falls. They were magnificent thanks to all that rain with the racing water sparkling in the sunshine. When we returned to Isallt House the coffee shop was still open so I took the opportunity of having another glass of that wonderful homemade ginger beer. I then walked to the nearby Coop and bought some food. Richard not only let us eat in the dining room but also provided plates and cutlery. It was a lovely way to end our last day there. All we had to do was to have yet another of those excellent breakfasts and begin the journey home. But not before Richard gave me a gift – a bottle of ginger beer! We went via Poynton in Cheshire to visit my eldest brother and his wife – and then got stuck in the traffic jams caused by road works on the M60. When we finally reached Wensleydale we agreed we had exchanged one beautiful part of Britain for another that day.